The artistic exploration of abstractionism is rough and painful, but one that the Chinese-French artist Jiang Dahai never regretted. Now with his grand and impressive paintings, he is showing his high accomplishments in abstract art. A featured event for the celebration of the 50th anniversary of Sino-French ties, Jiang Dahai's solo exhibition,Beyond, Clouds,recently debuted in Beijing, showing a fusion of Chinese and French art styles. The curator of the exhibition, Henry-Claude Cousseau, said at the exhibition that "If we show his paintings abroad, such as in Germany, the US or France, and we don't tell people the name of the artist at first, then I think no one will guess out they are from a Chinese artist, as Jiang Dahai has hidden the roots of the two cultures so masterly and ingeniously." 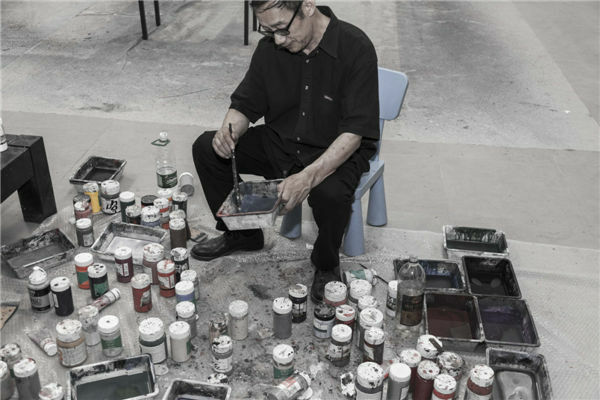 Jiang was among the second batch of students enrolled in the oil painting department at the Central Academy of Fine Arts, which recruited only four students at that time. One of his classmates went to the US later for further study, the other two stayed in China, and he chose to go to France in 1986 for the sake of art. According to him, one of the schoolmates who stayed home has been president of the CAFA, and the other one was also said to be in high position now. When he talked about this, he sighed but added that, "I never regret, ever". During his study in France, the president of the CAFA once went to see him and invited him to come back to China. He didn't think it was time to go back and refused, and then 20 years passed, until 2008, he came back to China with his mature abstract art.